They have a liquid center. Chewy on the outside, soft on the inside. How about a nibble on my little finger? It’s like a pretzel stick, only not as salty. One of the best parts of any holiday (for me anyway) is the food. Oh glorious ambrosia! Sweet and decadent morsels of the gods! *Ahem. * Sorry about that. Halloween, however, may be the only night of the year it’s acceptable to eat eyeballs and bones, worms and dirt, tombstones and warts. Personally (and I admit this has a lot to do with laziness), I normally stick to autumn-themed foods and deserts: pumpkin pie, apple pie, anything with “fall spices.” For instance, the other day I made some Snickerdoodle Blondies, mainly because the nutmeg and cinnamon was enough to evoke October. 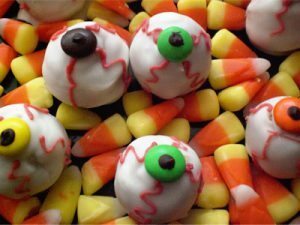 You see, to make a platter of gooey eyeball treats, I’d have to get all artistic with decorating my food. As much as I love to eat, and as much as I enjoy cooking, I’ve never been much of a food-artist. 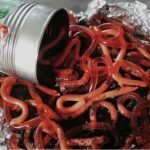 I love the *idea* of it, so long as some other Halloween enthusiast is putting the finishing flourishes on the worm cake. What kinds of Halloween treats do you cook up during October? Do you go all out with tombstone Rice Krispy Treats, or do you call it a night with some pre-made candy corn? As the month progresses, I’ll post recipes and pictures of the things I *do* make. In the meantime, peruse www.food.com for some truly grotesque Halloween food ideas. They have main course food as well as deserts and drinks. For me, a little nibble on my elbow should do me for now.